A single high-fat milkshake, with a fat and calorie content similar to some enticing restaurant fare, can quickly transform our healthy red blood cells into small, spiky cells that wreak havoc inside our blood vessels and help set the perfect stage for cardiovascular disease, scientists report. "We see this hopefully as a public service to get people to think twice about eating this way," says Dr. Neal L. Weintraub, cardiologist, Georgia Research Alliance Herbert S. Kupperman Eminent Scholar in Cardiovascular Medicine and associate director of MCG's Vascular Biology Center. "The take-home message is that your body can usually handle this if you don't do it again at the next meal and the next and the next," says Dr. Julia E. Brittain, vascular biologist at the MCG Vascular Biology Center and a corresponding author of the study. As a practicing cardiologist, Weintraub, also a corresponding author, has patients with cardiovascular disease who continue to eat a high-fat diet and he definitely asks them to think twice: "Is this food worth your life?" While none of the scientists recommend going overboard on calories and sugar either, the healthy males in the study who instead consumed a meal with the same number of calories but no fat - three big bowls of sugar-coated flakes with no-fat milk - did not experience the same harmful changes to their blood, red blood cells and blood vessels. "You are looking at what one, high-fat meal does to blood-vessel health," says Dr. Ryan A. Harris, clinical exercise and vascular physiologist at MCG's Georgia Prevention Institute and study co-author. "They changed size, they changed shape, they got smaller," Harris says of the rapid changes to the form and function of red blood cells. 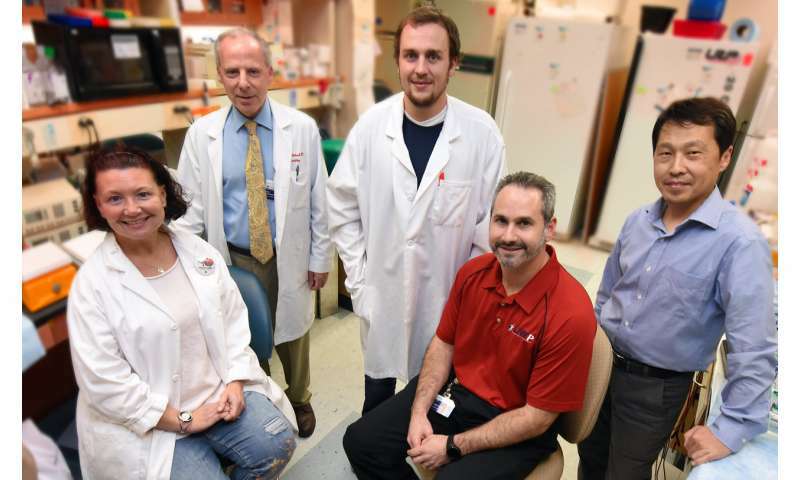 "Myeloperoxidase levels in the blood are directly implicated in heart attack," Weintraub notes. "This is a really powerful finding." MPO also impacts the cytoskeleton, the physical infrastructure of the usually plump red cells so they can't function and flex as well, says Tyler W. Benson, a doctoral student in The Graduate School at Augusta University and the paper's first author. "Again, your red blood cells are normally nice and smooth and beautiful and the cells, after consumption of a high-fat meal, get these spikes on them," says Brittain. Much like huge ice chunks do to a river, these physical changes affect how blood flows, she says. Bad changes occur quickly in these cells, which are "exquisitely sensitive" to their environment, Brittain says. At least in mice studies and in some of Brittain's other human studies, the unhealthy changes also resolve quickly, at about eight hours, unless the high-fat feasts continue. The investigators note they only tested their participants after four hours, which is about how long it takes food to digest. Harris' research team has done studies that indicate a single aerobic exercise session by young healthy individuals like these can counteract the unhealthy slump at four hours and related reduction in the blood vessels ability to dilate. Red blood cells, probably best known for carrying oxygen, are the most abundant cell type circulating in our blood. "You have 25 trillion red blood cells and they affect every other cell in your body," says Brittain. They also carry and release the energy molecule ATP and nitric oxide, which helps blood vessels relax, as well as cholesterol. The study, as is usually the case, is not measuring the effect of fat consumption. It is measuring an effect of high fat + high carbohydrate consumption versus high carbohydrate consumption. With 1000 calories total and 80 grams of fat (720 calories), there is a remainder of 280 calories (70 grams) which are mostly carbohydrates and probably mostly sugar since the drink is called a milkshake. More solid Science from the industry which gave rise to Retraction Watch. So the Inuit, who traditionally subsisted on animal fat during winter, should have gone extinct, right? Study only shows it was a good thing they weren't subsisting on milkshakes. And how many died prematurely over the 1000s of gens it took for them to adapt to this diet? They were subject to natural selection. We aren't. Modern medicine prolongs the lives of people who are too lazy and gluttonous and irresponsible to save themselves. Couldn't they have just fibbed a little bit? It's no fun cheating if that Mac Jr. could drop you in your car seat. Milkshake huh? Could it be sugar doing the damage and not just fat? This headline is very misleading. This is not referring a high-fat meal. It is a high-fat & high-sugar drink. How about something called a 'control' where some people received a milkshake that was 100% fat and had no carbohydrates or sugar at all? How about yet another group that receive a milkshake with less fat and more sugar? This sounds like the same sort of unethical junk science that started the low-fat craze and was probably financed by some sugar lobby. To top it off, it was a sample size of......10. What a powerful study. The issue as I see it is the sweetening of the milkshake with sugar, high fructose corn syrup, dextrose, etc. ; the issue is not the fat. As this study interested me, I decided to figure out what a meal with 80 grams of fat might look like. Based on the nutritional labels provided by Kraft Cheese (they'd never lie, right?) a person would have to consume 8ozs (a half pound) of Kraft's cheddar to hit that goal. High fat meal. Sets the stage. Heart disease. My great grandparents, grandparents, and my mother and father all ate high fat meals. That's because that is all they knew. Lard used for frying. Real butter. Real cream. Lots of salt. These are the ingredients of not a few generations, but hundreds of years of dieting by people from Europe, the Americas and even Asia and the Middle East as well as Africa. So no, a high fat meal doesn't 'set the stage' for anything, other than people in the medical field to babble about. If these types of ingredients were really that detrimental to humans, then we could not have become 7 billion strong! If you come from a family line who has heart issues, then of course, follow a high omega 3 diet and avoid saturated fats that aren't. Otherwise, eat whatever your heart desires, as the fact we are still going strong, living into our 60, 70s and 80s in the hundreds of millions attests to that. AS others have pointed out, this study did not look at the effects of a high fat meal. It was a high fat + high sugar meal. I don't know anybody advocating a diet that is both high in fat and high in sugar. They did compare it to a meal that was high sugar + low fat. Why didn't they also include a meal that was high fat + low sugar? They can't come to a conclusion that fat alone is the issue if they don't include that study. Could it be that they did include a high fat + low sugar meal and the results weren't what they wanted so they tossed it out?
" But with a single high-fat meal, they essentially grow spikes and spew poison." I am glad we are being scientific here and not writing emotive scaremongering prose. I have a feeling that perhaps the science part has been rewritten unhelpfully by someone else. The point " While none of the scientists recommend going overboard on calories and sugar either, the healthy males in the study who instead consumed a meal with the same number of calories but no fat - three big bowls of sugar-coated flakes with no-fat milk - did not experience the same harmful changes to their blood, red blood cells and blood vessels" seems to have been missed by some as it relates to high sugar intake and also the equivalency of three big bowls of sugar coated cereal - which surely indicates abnormal eating. Is overloading the stomach with any food source likely to have bad effects - for the milkshake it apparently means the red blood cells. Interesting for further investigation but maybe flawed. The food Nazis are back. I remember when a high protein diet was good then bad and then good again. I remember when a high fat diet was a no biggee, death incarnate, no biggee and back to death incarnate. I remember when a high carbohydrate diet was a no biggee, really good for you and death incarnate. I remember food with yeast was bad for a brief period. Unless it's already changed the latest fad is that gluten is bad for you. Basically I say eff it all and eat what I want. Chasing the chimera of a the 'ideal' diet is just too stressful. I have to agree with everyone else. Provide us with a list of ingredients + nutrition label for that milkshake and whether the ingredients are conventional or virgin, organic fats or else this is more of a witch hunt than a scientific study.